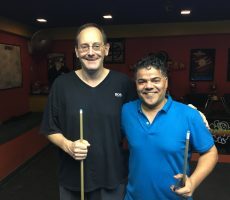 TUESDAY 10 BALL GRAND FINAL : GERHARD WINS. 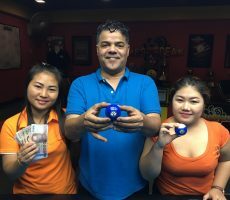 Congratulations go to Germany’s Gerhard Schebler for winning our Tuesday 10 Ball Grand Final for Season 17 on Saturday night. Gerhard, who is probably better known for his Chess prowess than his pool playing skills, played very well all night long to go undefeated through five straight matches and lift the trophy. 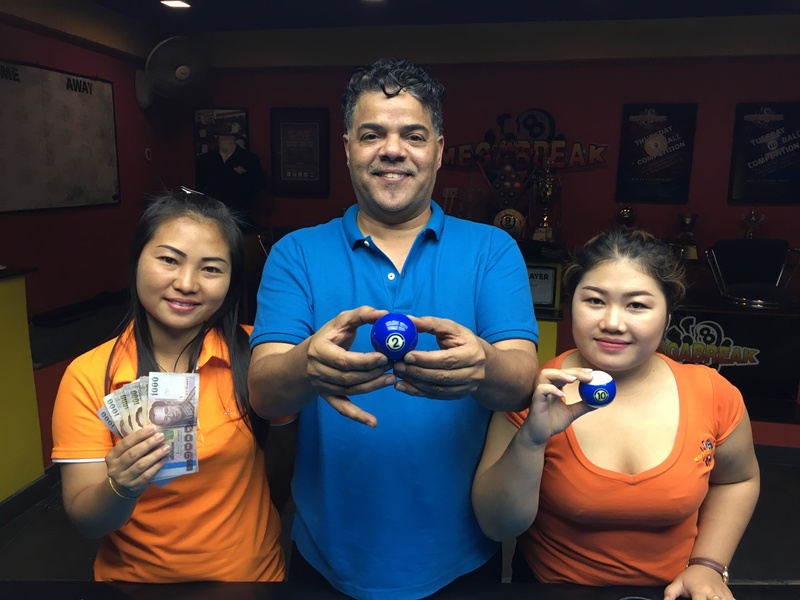 On a night which was dominated by players at the lower end of the handicap scale, he defeated Abdulah Ahmad from Qatar in the final of the Double Elimination event to pocket the 1st Prize of 10500 baht. The race was Abdulah 6-4 and when Gerhard took an early 2-0 and 3-1 lead the writing was on the wall for our Middle Eastern friend. 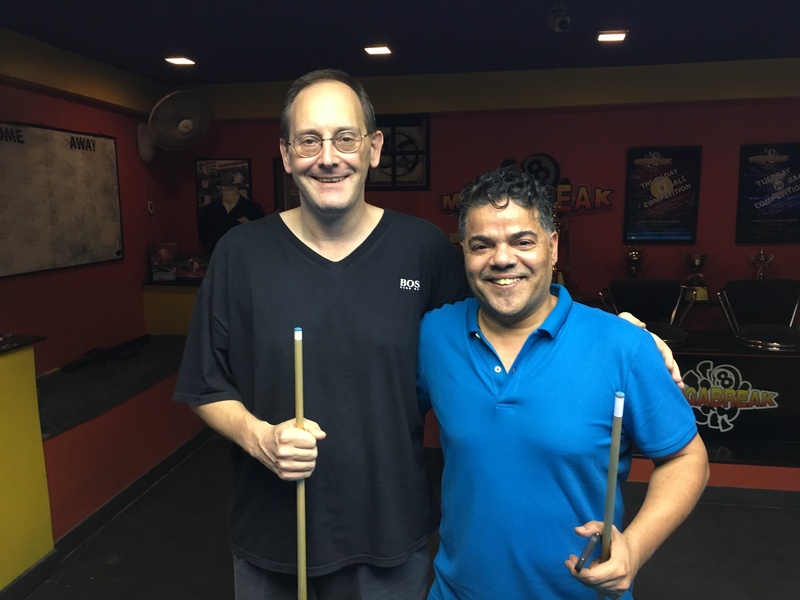 Abdulah did fight back to win the next two and make the score 3-3, but Gerhard wasn’t going to be denied and sealed a comfortable victory by 4 racks to 3 in the 7th rack. 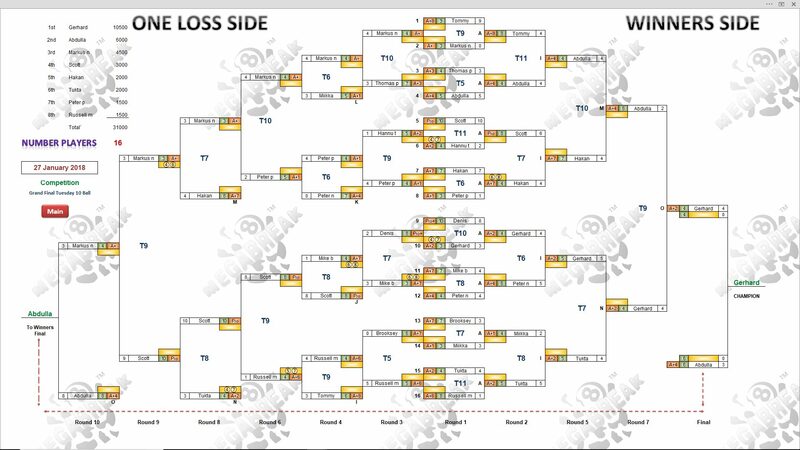 Abdulah played well to reach the final, only losing out twice on the evening to our champion, and took home 6000 baht as Runner-Up. 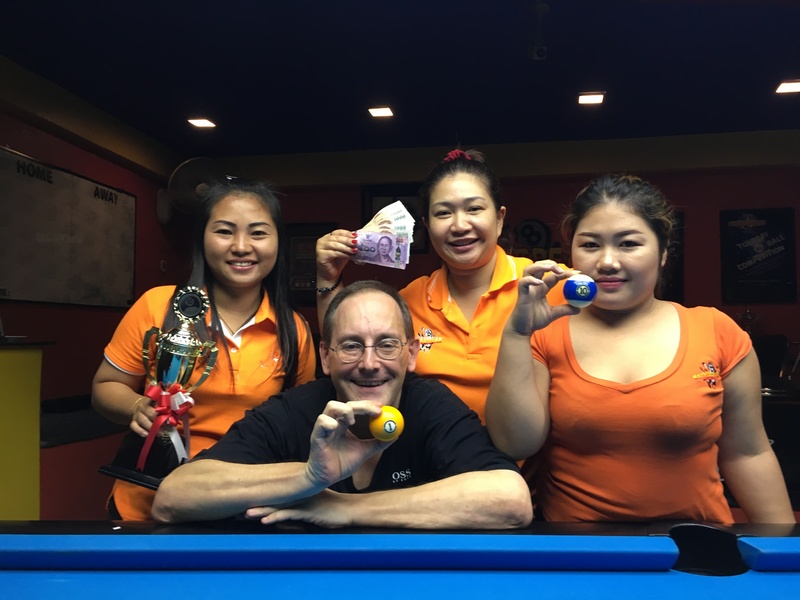 Gerhard’s fellow countryman, Markus Jo Ma Nolberczak, recorded his best finish in a Grand Final to take 3rd Place, receiving 4500 baht. 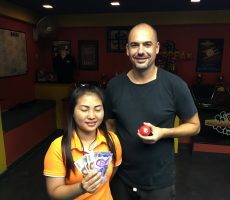 Champion : Gerhard (A+2) – 10500 baht. Runner-Up : Abdulah (A+4) – 6000 baht. 3rd : Markus (A+) – 4500 baht. 4th : Scott (Pro) – 3000 baht. Equal 5th : Håkan (A+7) and Tukta (A+2) – 2000 baht each. 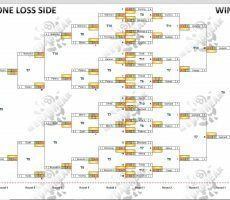 Equal 7th : Russell (A+6) and Peter P (A+1) – 1500 baht each. The Player Auction Prize Pot totalled 24800 baht and was won by Brooksey Brooks from England. 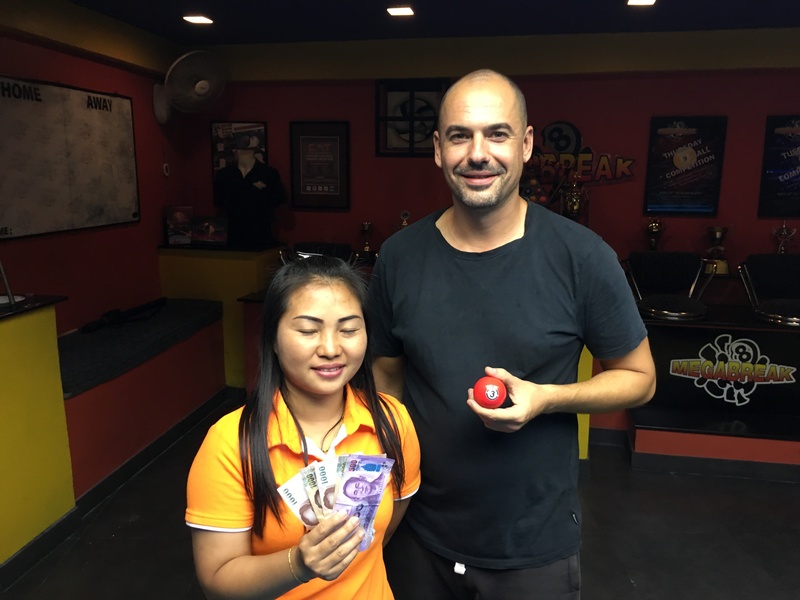 He bought Gerhard for the cheapest price of all at 800 baht, and collected the 1st Payout of 10k. 1st (40%) : Brooksey (Gerhard) – 10000 baht. 2nd (30%) : Gerhard (Abdulah) – 7400 baht. 3rd (18%) : Tukta (Markus) – 4400 baht. 4th (12%) : Hannu (Scott) – 3000 baht.